The aircraft shown here, Chicago, led the first round the world flight in 1924. The first aerial circumnavigation of the world was conducted in 1924 by a team of aviators of the United States Army Air Service, the precursor of the United States Air Force. The trip took 175 days, covering over 27,553 miles (44,342 km). In 1929 Australian Charles Kingsford Smith completed the second circumnavigation of the world by flight, and the first within both hemispheres, including the first trans-Pacific flight to Australia in 1928. In the early 1920s several countries were vying to be the first to fly around the world. The British had made one unsuccessful around-the-world air flight attempt in 1922. The following year, a French team had tried; the Italians, Portuguese, and British also announced plans for a world-circling flight. In the spring of 1923, the U.S. Army Air Service became interested in having a squadron of military aircraft undertake a round-the-world flight. It assigned a group of officers in the War Department planning group, the job of finding a suitable aircraft and planning the mission. The War Department instructed the Air Service to look at both the Fokker T-2 transport and the Davis-Douglas Cloudster to see if either would be suitable and to acquire examples for testing. [N 1] Although deemed satisfactory, the planning group considered other U.S. Air Service military aircraft both in service and production, with a view that a dedicated design that could be fitted with interchangeable landing gear, wheeled and pontoons for water landings, would be preferable. Douglas, assisted by Jack Northrop, began to modify a DT-2 to suit the circumnavigation requirements. The main modification involved its fuel capacity. All the internal bomb carrying structures were removed with additional fuel tanks added to the wings and fuselage fuel tanks enlarged in the aircraft. The total fuel capacity went from 115 gallons (435 liters) to 644 gallons (2,438 liters). Lieutenant Nelson took the Douglas proposal to Washington where Major General Mason M. Patrick, Chief of the Air Service, approved it on 1 August 1923. The War Department awarded an initial contract to Douglas for the construction of a single prototype. The prototype met all expectations, and a contract was awarded for four more production aircraft and spare parts. The last DWC was delivered on 11 March 1924. The spare parts included 15 extra Liberty engines, 14 extra sets of pontoons, and enough replacement airframe parts for two more aircraft. These spare parts were sent ahead to locations along the route around the world the aircraft planned to follow. The pilots trained in meteorology and navigation at Langley Field in Virginia, where they also practiced in the prototype. The crews then practiced on the production aircraft in Los Angeles and San Diego. On 6 April 1924, they left Seattle for Alaska. After reaching Prince Rupert Island, the lead aircraft Seattle, flown by Maj. Frederick Martin with SSgt. Alva Harvey (the only fully qualified mechanic in the flight), needed repairs and remained behind. When it was repaired, the crew attempted to catch up with the other three aircraft, but on 30 April, Seattle crashed in dense fog into a mountainside near Port Moller, Alaska on the Alaska Peninsula. The crew survived and were picked up on 10 May, but the aircraft was destroyed. The three remaining aircraft continued, with Chicago flown by Lt. Smith and 1st Lt. Arnold, assuming the lead. [N 4] Taking off from the Aleutian Islands, the flight traveled across the North Pacific archipelago. Avoiding the Soviet Union, which had not given permission for the expedition to cross into their airspace, they crossed Japan, Korea, the coast of China, Hong Kong, French Indochina, Thailand, Burma, and India, and proceeded into the Middle East and then Europe. During the mission, due to a broken connecting rod, the Chicago was forced to land in a lagoon off the Gulf of Tonkin in French Indochina (now Vietnam). 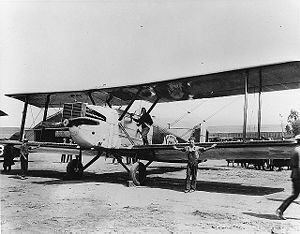 The aircraft was considered a novelty in this region of the world, so missionary priests supplied the pilots with food and wine and locals climbed aboard the pontoons to see the biplane. The other flyers searching for the Chicago by boat found the crew sitting on the wing in the early morning hours. Three paddle powered sampans with local crews towed the aircraft for 10 hours, and 25 miles (40 km), to the city of Hue, where repairs were effected. "[T]he fastest – and undoubtedly the first – engine change that had ever been made in Indochina." Misfortune was again to strike the Chicago as later in the mission, while inspecting the aircraft in Calcutta, Smith slipped and broke a rib but insisted on completing the mission. The flight arrived in Paris on Bastille Day, 14 July. From Paris the aircraft flew to London and on to the north of England in order to prepare for the Atlantic Ocean crossing. On 3 August 1924, while flying across the Atlantic, Boston was forced down. The Chicago was able to contact a navy destroyer and dropped a note about the troubled aircraft, tied to the Chicago's only life preserver. While being towed by the U.S. Navy light cruiser USS Richmond, which had picked up the crew, the Boston capsized and sank. The Chicago with Lt. Lowell Smith and 1st Lt. Leslie Arnold still in the lead, and the New Orleans, with Lt. Erik Nelson and Lt. Jack Harding, continued and crossed the Atlantic via Iceland and Greenland and reached Canada. The original prototype, now named Boston II, reunited with the Boston's crew, Lt. Leigh Wade (pilot) and SSgt. Henry Ogden, met them in Pictou, Nova Scotia, and the three aircraft flew on to Washington DC. After a hero's welcome in the capital, the three Douglas World Cruisers flew to the West Coast, on a multi-city tour, stopping briefly in Santa Monica and finally landing in Seattle on 28 September 1924. The trip had taken 175 days, and covered 27,553 miles (44,342 km). The Douglas Aircraft Company adopted the motto, "First Around the World – First the World Around". [N 5] The American team had greatly increased their chances of success by using several aircraft and pre-positioning large caches of fuel, spare parts, and other support equipment along the route. At prearranged way points, the World Flight's aircraft had their engines changed five times and new wings fitted twice. The flight traveled largely from East to West, beginning in the United States in April 1924 and returning to its start point in September. It flew northwest to Alaska across northern-Pacific islands to Japan and then south-Asia, across to Europe and the Atlantic Ocean. At the request of the Smithsonian Institution, the U.S. War Department transferred ownership of the Chicago to the museum for display. It made its last flight from Dayton, Ohio to Washington, D.C. on 25 September 1925. It was almost immediately put on display in the Smithsonian's Arts and Industries Building. In 1974, the Chicago was restored under the direction of Walter Roderick, and transferred to the new National Air and Space Museum building for display in their Barron Hilton Pioneers of Flight exhibition gallery. Beginning in 1957, the New Orleans was displayed at the National Museum of the United States Air Force in Dayton. The aircraft was on loan from the Los Angeles County Museum of Natural History and was returned in 2005. Since February 2012, the New Orleans is a part of the exhibits at the Museum of Flying in Santa Monica, California. The wreckage of the Seattle was recovered and is now on display in the Alaska Aviation Heritage Museum. The original Boston sank in the North Atlantic, and it is thought that the only surviving piece of the original prototype, the Boston II, is the aircraft data plate, now in a private collection, and a scrap of fuselage skin, in the collection of the Vintage Wings & Wheels Museum in Poplar Grove, Illinois. The best in flight Mackay Trophy for 1924 was awarded to Lowell Smith, Leslie Arnold, Leigh Wade, Erik Nelson and Henry Ogden. Later, Major Martin was in command of Army aviation units in Hawaii at the time of the Japanese attack on Pearl Harbor. His mechanic Alva Harvey was commissioned and commanded heavy bomb groups during World War II. Lt. Nelson rose to the rank of colonel and became one of General Henry Arnold's chief trouble-shooters on the development and operational deployment of the Boeing B-29 Superfortress. The Southern Cross at a RAAF base near Canberra in 1943. The first aerial circumnavigation of the world that involved the crossing of the equator twice was made using a single aircraft, the Southern Cross, a Fokker F.VIIb/3m trimotor monoplane. Southern Cross, Charles Kingsford Smith (lead pilot), Charles Ulm (relief pilot), James Warner (radio operator), and Harry Lyon (navigator and engineer). After completing the first trans-Pacific crossing on 9 June 1928, flying from Oakland, California to Brisbane, Australia, Charles Kingsford Smith and Charles Ulm spent several months making other long-distance flights across Australia and to New Zealand. They decided to use their trans-Pacific flight as the first leg of a globe-circling flight. They flew the Southern Cross to England in June 1929, then across the Atlantic and North America, returning to Oakland where their trans-Pacific flight had begun. Before Kingsford Smith's death in 1935, he donated the Southern Cross to the Commonwealth of Australia, for display in a museum. The aircraft is preserved in a special glass 'hangar' memorial on Airport Drive, near the International Terminal at Brisbane Airport in Queensland, Australia. ^ During 1922–1923, the Fokker T-2 was used by the U.S. Army to set a series of long distance and endurance records. ^ Lt. Nelson was eventually assigned to the World Flight as the pilot of DWC #4. ^ The aircraft names were chosen to represent "the four corners of the United States." The individual aircraft were formally christened with waters from their namesake cities, prior to departure from Seattle where Boeing Company technicians configured the aircraft for the long over-water portion of the flight, by exchanging wheels for pontoon floats. ^ One of the Army's best aviators, 1st. Lieutenant Lowell H. Smith, was named to pilot the Chicago and was permitted to choose his own co-pilot, 1st Lt. Leslie P. Arnold, who would double as a flight mechanic. ^ The Douglas logo evolved into an aircraft, a rocket, and a globe and was adopted by the McDonnell Douglas Corporation following the merger of Douglas and the McDonnell Aircraft Corporation in 1967, and then became the basis of the logo of the Boeing Company following its acquisition of McDonnell Douglas in 1997. ^ a b c d "Collections: Douglas World Cruiser Chicago – Long Description." National Air and Space Museum. Retrieved: 7 July 2012. ^ Swanborough and Bowers 1963, p. 548. ^ "Fine American Duration Flight." Flight, 19 October 1922, p. 615. ^ a b c d Rumerman, Judy. "The Douglas World Cruiser – Around the World in 175 Days." U.S. Centennial of Flight Commission, 2003. Retrieved: 7 July 2012. ^ a b "First to fly around the world." Did You Know.org. Retrieved: 7 July 2012 . ^ a b c Mackworth-Praed 1990, p. 235. ^ Boyne 1982, p. 80. ^ Yenne 2003, p. 48. ^ a b c "Douglas DT-2 World Cruiser." Aviation Central.com. Retrieved: 7 July 2012. ^ Francillon 1979, p. 75. ^ Bryan 1979, p. 122. ^ Stoff 2000, p. 21. ^ a b "Douglas World Cruiser Transport." Archived 25 June 2012 at the Wayback Machine Boeing. Retrieved: 7 July 2012. ^ a b c "First round-the-world flight." National Museum of the United States Air Force, 8 July 2009. Retrieved: 14 July 2017. ^ "South Hangar: Douglas World Cruiser 'Seattle'." Archived 22 June 2012 at the Wayback Machine Alaska Aviation Heritage Museum. Retrieved: 7 July 2012. ^ a b Roberts, Chuck. "Magellans of the sky: lessons learned from the epic 1924 around the world flight are visible in today's Air Force, but the memory of those who made it possible have faded with the years. (A Centennial of Flight Special Feature)." Airman (subscription required), 1 July 2003. Retrieved: 20 July 2012. ^ Wendell 1999/2000, pp. 339–372, 356–366. ^ Haber 1995, pp. 72–73. ^ "Fliers At Seattle End World Flight of 27,000 Miles." The New York Times, 28 September 1924, p. 1. Retrieved: 29 July 2012. ^ "Trademarks and Copyrights: Boeing logo." Archived 21 June 2012 at the Wayback Machine Boeing Trademark Management Group, Boeing. Retrieved: 5 July 2012. ^ "Round-the-World Flights: 1st Round-the-World Flight." Wingnet, Wilmington Philatelic Society. Retrieved: 29 July 2012. ^ Boyne 1982, p. 18. ^ Ogden 1986, p. 168. ^ "Exhibits." Los Angeles County Museum of Natural History. Retrieved: 5 July 2012. ^ "Exhibits & Features." Archived 11 July 2012 at the Wayback Machine Museum of Flying, Santa Monica Airport, 2012. Retrieved: 7 July 2012. ^ "South Hangar: Douglas World Cruiser 'Seattle'." Archived 22 June 2012 at the Wayback Machine Alaska Aviation Heritage Museum. Retrieved: 5 July 2012. ^ "Featured Artifact: Fabric from the Boston II Douglas World Cruiser." Archived 1 August 2012 at the Wayback Machine Vintage Wings & Wheels Museum. Retrieved: 5 July 2012. ^ "Mackay 1920-1929 Recipients - NAA: National Aeronautic Association". naa.aero. ^ a b Sherman, Stephen. "Charles Kingsford Smith: First to Fly Across the Pacific." acepilots.com, 16 April 2012. Retrieved: 7 July 2012. ^ Cross 1972, p. 71. ^ Cross 1972, p. 74. ^ "RAAF Fokker F.VIIB Southern Cross VH-USU." ADF Aircraft Serials. Retrieved: 7 July 2012. Boyne, Walter J. The Aircraft Treasures Of Silver Hill: The Behind-The-Scenes Workshop Of The National Air And Space Museum. New York: Rawson Associates, 1982. ISBN 0-89256-216-1. Bryan, Courtlandt Dixon Barnes. The National Air and Space Museum. New York: Harry N. Abrams, Inc., 1979. ISBN 978-0-810-98126-3. Cross, Roy. Great Aircraft and Their Pilots. New York: New York Graphic Society, 1972. ISBN 978-0-82120-465-8. Donald, David, ed. Encyclopedia of World Aircraft. Etobicoke, Ontario: Prospero Books, 1997. ISBN 1-85605-375-X. Francillon, René J. McDonnell Douglas Aircraft Since 1920: Volume I. London: Putnam, 1979. ISBN 0-87021-428-4. Haber, Barbara Angle. The National Air and Space Museum. London: Bison Group, 1995. ISBN 1-85841-088-6. Mackworth-Praed, Ben. Aviation: The Pioneer Years. London: Studio Editions, 1990. ISBN 1-85170-349-7. Ogden, Bob. Great Aircraft Collections of the World. New York: Gallery Books, 1986. ISBN 1-85627-012-2. Stoff, Joshua. Transatlantic Flight: A Picture History, 1873–1939. Mineoloa, New York: Dover publications, Inc., 2000. ISBN 0-486-40727-6. Swanborough, F. Gordon and Peter M. Bowers. United States Military Aircraft since 1909. London: Putnam, 1963. Wendell, David V. "Getting Its Wings: Chicago as the Cradle of Aviation in America." Journal of the Illinois State Historical Society, Volume 92, No. 4, Winter 1999/2000, pp. 339–372. Will, Gavin. The Big Hop: The North Atlantic Air Race. Portugal Cove-St.Phillips, Newfoundland: Boulder Publications, 2008. ISBN 978-0-9730271-8-1. Yenne, Bill. Seaplanes & Flying Boats: A Timeless Collection from Aviation's Golden Age. New York: BCL Press, 2003. ISBN 1-932302-03-4. Wikimedia Commons has media related to 1924 Round The World Flight. This page was last edited on 15 February 2019, at 21:09 (UTC).